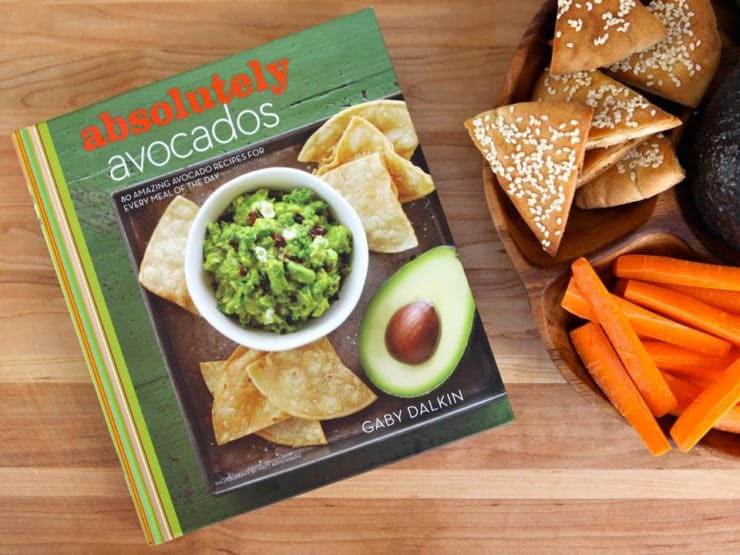 My friend Gaby Dalkin just released a new cookbook, “Absolutely Avocados,” and I couldn’t be happier for her. Gaby writes a terrific blog called What’s Gaby Cooking. If you haven’t checked it out before, you must. She’s super creative in the kitchen. Gaby loves avocados; in fact, I’d go so far as to say they’re her culinary passion. Her new book includes everything you would ever want to know about this delicious green fruit (yes, it is a fruit! ), along with a number of creative, innovative avocado recipes. Today is Cinco de Mayo – click here to learn about the history of the holiday. With guacamole making an appearance on tables across the United States, what better day to celebrate Gaby’s fabulous new cookbook? As I browsed her many tempting recipes, I stopped short on her Avocado Cilantro Hummus. Be still my heart. Avocado and hummus, two of my favorite things combined into one. I was ready to rock my kitchen, and my food processor, with a South-of-the-border-inspired hummus recipe. I made a few small modifications to Gaby’s original recipe, which is also totally great in its original form… but you all know I’m a hummus freak, and I can’t help myself. I peeled the chickpeas before processing them, which produces a creamier hummus. This tip was shared with me several years ago by a friend in Israel, but over time I got lazy and stopped doing it because of the amount of time and effort involved. Smitten Kitchen recently reminded me what a difference it makes in the texture of the final product, so I’ve started peeling again. It does take a few minutes (about 10-15 for the amount of chickpeas in this recipe), so if that’s too fussy or time consuming for you, just skip it. The good news about peeling the chickpeas is that you’ll need less oil to get a smooth and creamy result. I was able to cut the olive oil in half and still get a creamy texture thanks to the peeling step. Also, instead of hot sauce or Tabasco (which I didn’t have in my fridge), I used sriracha. It worked great, so I’ve added it as an option below. Otherwise, the recipe appears as written. I know, I know… some of you can’t stand cilantro. I can hear you kvetching already. Personally, I happen to love fresh cilantro and it really gives this hummus a Mexican essence. That said, if you feel like cilantro tastes “soapy” or unappealing (some people have this quirky genetic predisposition), just leave it out. The hummus will still be rich, creamy and divine. It’s a great alternative to guacamole and a unique twist on Middle Eastern-style hummus. Paired with baked pita chips, tortilla chips or fresh vegetable crudités, this is a unique and yummy appetizer your guests will swoon for. You can buy Gaby’s cookbook “Absolutely Avocados” here. It contains all of the avocado recipes you could ever need, from Charred Corn Guacamole to Avocado Caesar Dressing to Avocado Chocolate Chip Cookies (yes, really!). A note to my kosher readers- it’s not a kosher cookbook, but most of the recipes are kosher or easily adaptable. I’m finding “Absolutely Avocados” is full of inspiration, a perfect gift for the avocado lover on your list. 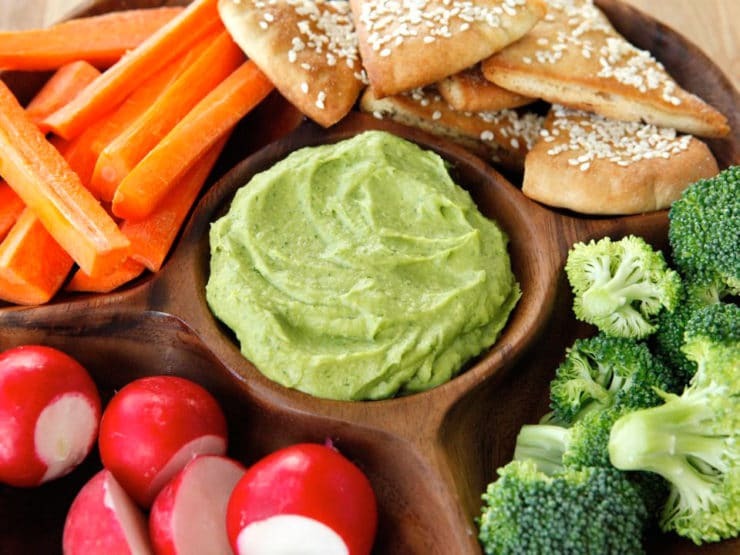 Learn to make creamy Avocado Cilantro Hummus from Gaby Dalkin's cookbook "Absolutely Avocados." Great alternative to guacamole. Start with cooked or canned and drained chickpeas. I like to peel the chickpeas to give the hummus a creamier texture. This will take you 10-15 minutes. If you're in a hurry you can skip this step, but you'll need a little more olive oil to achieve a creamy texture. 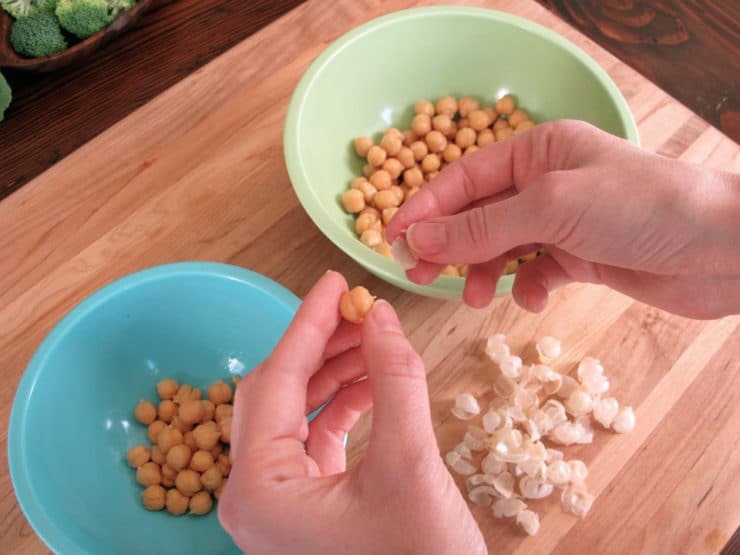 Peeling the chickpeas is a simple process-- just grasp a chickpea between your thumb and forefinger and squeeze gently into your other hand till the skin loosens and releases. Repeat for the remaining chickpeas. 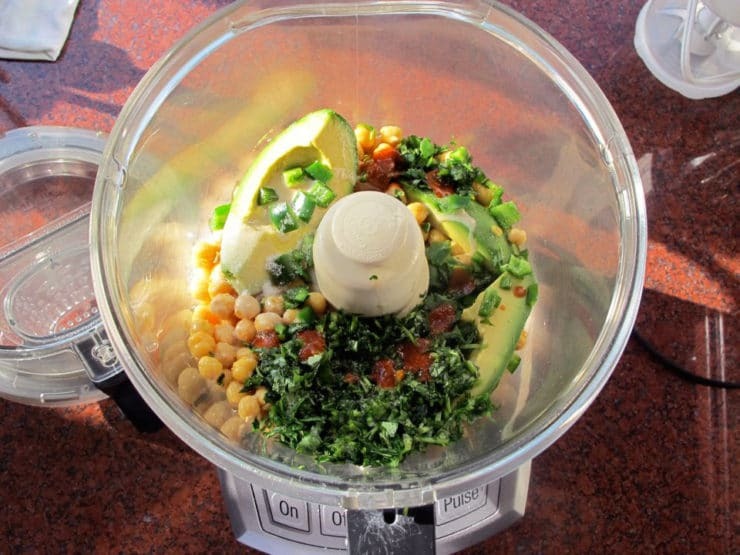 Place the chickpeas (peeled or unpeeled) into the food processor. 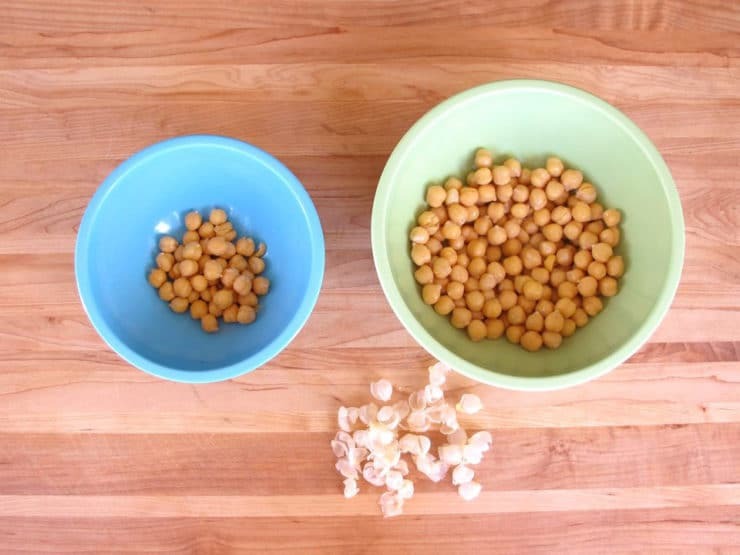 Add 1/4 cup olive oil if you have peeled your chickpeas, or 1/2 cup olive oil for unpeeled chickpeas. Pit and peel the avocado and add it to the processor along with cilantro, jalapeño, lemon juice, tahini, hot sauce and salt. Pulse the ingredients a few times, then process for 2-3 minutes. Scrape the sides of the processor once or twice to make sure all ingredients are fully incorporated. Continue processing till the hummus is smooth and creamy. Adjust salt and seasoning as desired and process a final time. 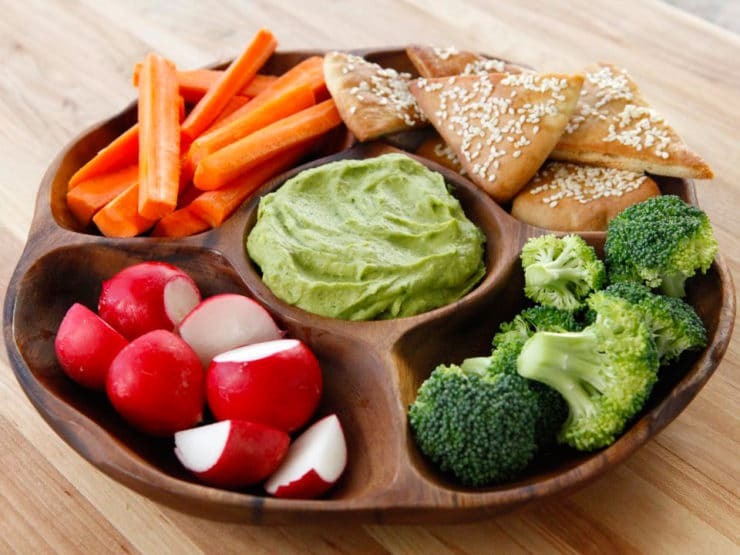 Serve immediately with pita chips or assorted crudités. You can refrigerate this hummus for up to 3 days, but keep in mind that the color will not look as bright green and fresh after the first few hours. If storing in the fridge, cover tightly with plastic wrap, leaving no gap between the wrap and the surface of the hummus. This will help to keep it from discoloring. I’m about to get all the ingredients and make it. Tried this hummus in s restaurant in AZ for the first time with some grilled chicken and pita bread it was great. I will keep you posted. I have to confess! My hubby and I fell in love with this avocado hummus recipe. We’ve been trying out different veggie recipes, health purposes, and fortunately found you’re page! Looking forward trying other recipes. Really grateful with you for sharing your knowledge! 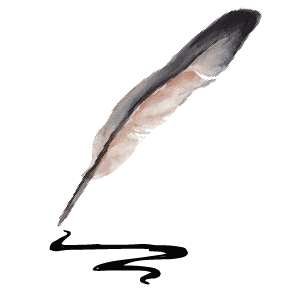 Fabulous Angela thanks for writing! Just made this, absolutely delicious, moorish and tasty! Yummy. So nice to find a healthy alternative that tastes so very good 🙂 thanks! Also, for those of you who, like me, are not cilantro fans, I have learned that just a sprinkle of the fresh herb does not give it the soapy weird taste usually found on truly mexican dishes (that use a ton of it) but instead will guve your dish a bright flavor. Trust me and try. Literally, just a sprig will do! Sounds yummy! I’d never remove the skin of the chickpeas just because they are so nutritious and I will definitely take it easy on the cilantro. Great idea combining both! Can’t wait to try! hey, for a quick jump step, before processing and instead of peeling the peas, I press them on to a tight/narrow strainer. the skins stay out, the peas are in. with less effort and less time. enjoyed this gorgeous hummus this morning with my beautiful friends in a wonderful garden in an marvellous area in jaffa/ israel. such a great taste of good and healthy food. yummie!!! next time i will try to add garlic. i missed it. Jaffa… sigh… wish I was there with you! This was so tasty! I added less olive oil and added more water instead and one clove garlic. Another great recipe of yours to add to my recipes’ book! This sounds wonderful!! Gonna give this a try!! I´m also thinking of adding some chopped green onions and/or garlic (pasted-with a bit of salt in mortar/pestle) added to it…has Gaby tried this way? I believe anyone can learn to like cilantro. I used to hate it. Now I like it. Why? My Persian/Israeli wife uses it all the time. Can you conceive of a Chinese person who dislikes soy sauce? Of course not. There are societies in which cilantro is as pervasive as soy sauce in China…Puerto Rico, for example. Can you conceive of a Puerto Rican disliking cilantro? I rest my case. You could also sub chives too!! I learned about peeling the chickpeas and when I can get my husband to do it, we do like the result. He’s one of those people who doesn’t like cilantro. Turns out, according to a food science expert, the association of cilantro with soap is not genetic. It has to do with the fact that an element in cilantro is present in many soaps and lotions that are used even on small children. So those who first encountered the smell in soap tend to associate cilantro with soap. Didn’t happen to me so I love the stuff and he’s learned to live with it. I like hummus, I will try the way you did.Can you please add something how to make home made pita bread? Thanks for sharing. I´ve tried Humus and I never like it, but I keep trying. This one I have the feeling I´m gonna love. Thank you so much Tori for sharing this! 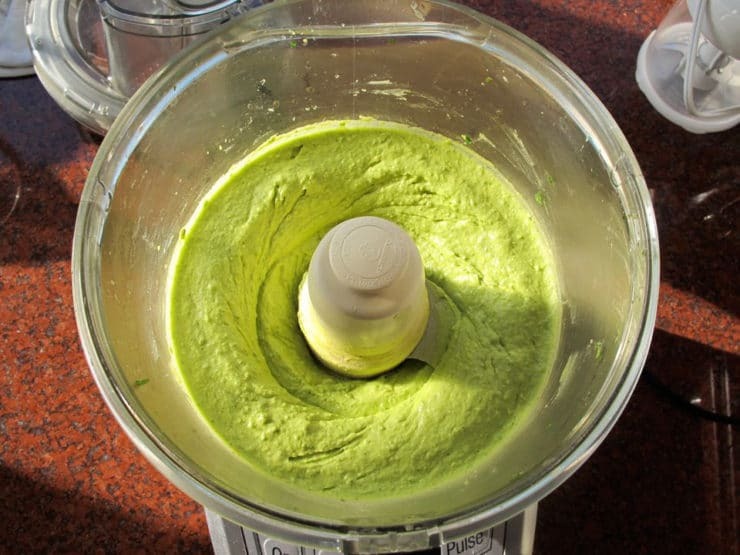 I´m going to try this avocado, hummus & cilantro combination – sounds great and healthy…. Brilliant concept! But no garlic? I read through your ingredient list to be sure. Interesting. Personally, I’d add a fresh garlic clove or two, but to each his own. Can’t wait to try it! No garlic in the original recipe, but I think a fresh clove would be great. Enjoy! This looks so good! The book looks great too, thanks for the recommendation. I would NEVER kvetch about cilantro (go through a bunch per week! ), think avocados are among nature’s perfect foods, and love hummus, so I think that tin of chickpeas in the cupboard now has a destiny. And the weather has warmed up! i am an old frenchy, who lived for 20 ans in the Middle East,and now lives in Florida,I love to cook and I am very curious about food . Since when does guacamole have chickpeas and tahini in it?? You are so right! My bad. 😉 Thanks! Sounds great! Perhaps a seeded diced poblano pepper in place of the jalapeno and some diced red onion would be good as well. I love both chick peas and avocados so this recipe sounds great to me! What a nutritionally dense dip! I´ve seen something similar made with white beans and avocados. For my fellow cilantro haters…you can substitute parsley. Yes please, but hold the cilantro! My kinda food yummy ! YES!!! Please. Now. Thank you. I am not a fan of hummus but this I would happily try.